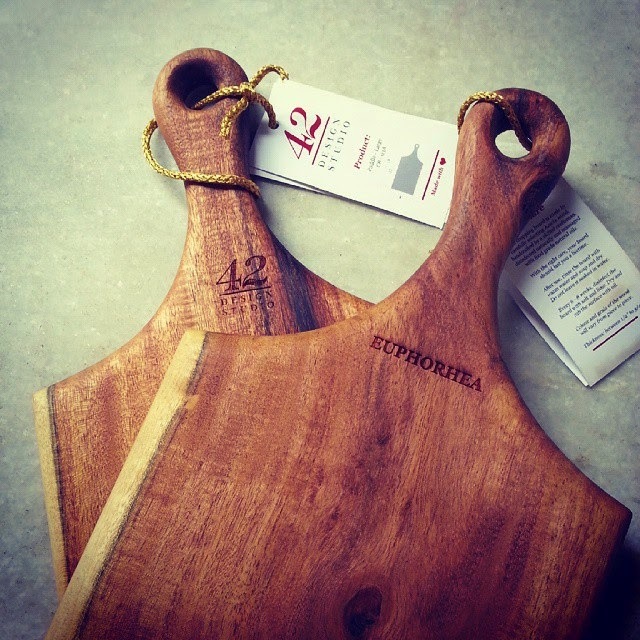 I've just treated myself to a beautiful wooden chopping board that I bought from 42 Design Studio. A lovely paddle shaped board with beautiful wood grain, I lost my heart when I first saw the photos on Facebook. I promptly ordered one for myself already imagining the photos I would take with this beauty as a prop! Finally it arrived and I couldn't wait to use it. I thought a nice loaf of bread would be perfect to inaugurate the board. Once I started getting more interested in homemade bread I did what most of us do - joined a couple of interest groups on Facebook. I looked in the files of one of the groups and read a few recipes till I found one that I felt confident enough to tackle and had the ingredients ready and available. I was going to make a Challah - a Jewish bread that's pretty to look at and is usually eaten on the Sabbath and on other special days. In fact, there are versions of this bread all across Europe. I gathered the ingredients, cleaned my work space thoroughly, and set out to make my Challah. Things went wrong right from the outset. Though my yeast bloomed perfectly and I followed the instructions to the T there was no dough - just a big bowl of paste, or batter if you want to be more polite. I gave it more time to rise, since the initial steps were new to me, thinking that the cold weather was probably affecting things. Eventually I realised this wasn't working and I wasn't going to be able to do this bread by hand. I cranked up the Kitchen Aid and poured the batter (!) into the mixer bowl. I dug out my flour canister and got ready to attempt to turn the batter into dough. I thought I needed to just add a little, bit by bit, and all would be well. It wasn't. The batter remained a batter and eventually I started flinging in fistfuls of flour instead of measured tablespoons. After adding as much flour as the recipe originally asked for I finally came close to a dough. It was still sticky but at least it wasn't pouring consistency! I came back to my work area, floured the surface and plonked the dough on. A few minutes of hand kneading with generous lashings of more flour, and I finally had what I thought was a satisfactory dough. I buttered a large, no huge, bowl and set the dough to rise. It doubled in half the prescribed time. I had no idea what was going on! But hey, it was supposed to double and it had done that. I wasn't arguing. The dough was duly punched down and left to rest for 10 minutes as prescribed. It rose ominously in those 10 minutes. By now I was frazzled and not thinking quite clearly. I forgot I had doubled the flour and therefore ended up with a lot more dough than I should have. Ideally I should have halved the dough and probably frozen half. But I don't yet know for sure what dough can be refrigerated/frozen and what can't. But I did divide the dough, into two parts, just not equal ones. I proceeded to further divide the bigger lump into three portions, rolled each portion into ropes and then made a simple basic three strand braid. It was rising as I was making the ropes an then braiding. It was like a dough possessed. Anyway, I brushed it with an egg wash and put the braid into my biggest and only deep baking pan, lined with baking parchment. I left it to prove and proceeded to make a braid with the smaller lump of dough too. In the few minutes that it took me to make the second braid the first one had grown alarmingly fat. I kept an eye on it and put it in to bake as soon as it had doubled. It certainly didn't take the 45 minutes it was supposed to. Seeing how fast the dough was rising I shoved the smaller braid into the fridge so that it would go slower. I had to bake the big one and I couldn't take a chance with the smaller one turning into another giant loaf. I could have wept with relief when I popped the big braid into the oven to bake. The recipe didn't say what temperature to bake at. I wanted to fling something at someone. Anyone. I took a chance and set the oven to preheat at 160 and then baked at the same for around 35-40 minutes. Just before putting the braid into the oven I brushed with egg again and sprinkled poppy seeds on the loaf. I could have wept again when out emerged what looked like a perfectly baked Challah. Okay, it wasn't that beautiful, nutty brown, but otherwise it looked quite good. Just a tad pale and a little gargantuan. Well, actually it was ridiculously huge! The hubby is confident there's enough in that one loaf to last us a week. I'm sharing what I think will be a successful recipe for a Challah keeping in mind all the adjustments I made. I'm quite clueless why the dough chose to rise at such a speed but fortunately the bread turned out quite fine. This recipe will give you two loaves. In a jug or bowl bloom the yeast in the warmed water. Stir with a spoon and leave it alone for a few minutes. In a big mixing bowl stir the salt into the white flour. Once the yeast is bubbling get ready to mix it into the flour. Push the dry flour to the sides of the bowl to make a well and pour the yeast solution in. Mix in just enough flour to make a paste in the middle leaving dry flour around. Cover and leave the flour paste to bubble up. This should take around 20 minutes. Once the flour paste has bubbled add the melted butter, honey and beaten eggs into the paste and mix. Gather in the dry flour from the sides and combine to make a soft dough. (Since the proportions in the recipe I followed were wrong this step worked very differently for me and I had to add flour endlessly to get a dough). You can either knead this dough by hand on your work surface or you can do it in a stand mixer if you have one. Work the dough for around 10 minutes till it's soft and elastic, and not sticky any more. Put it in a large greased bowl, cover with a damp napkin and leave it to rise. Depending on the yeast, the weather, and the various bread gods, this should take anything from an hour to two hours. While the dough is rising watch a few videos on YouTube to see braiding techniques. There are simple 3 strand braids and there are many more beautiful, but complicated braids that you can also try. 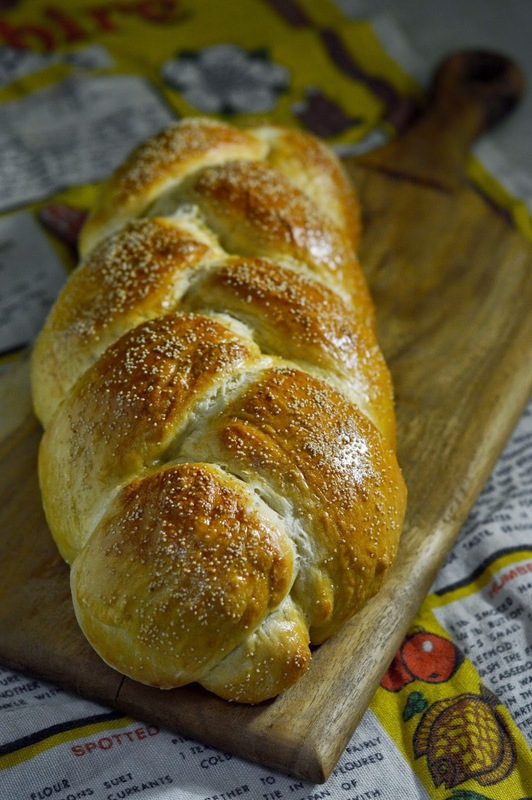 With two loaves guaranteed, it won't hurt to try two different braids. Punch the dough down and give it a quick and gentle knead. Let it rest for a few minutes. Divide the dough into two halves. Make 3 portions or more with each half, roll each portion into a rope and braid into a loaf. Brush with the egg yolk to which you add a little water. Just a teaspoon or so. Bread expert Sujit Sumitran shared this little tip saying the yolk and water mix will give you that lovely dark brown classic challah colour. Leave the braids to prove and double. If your dough is rising too fast just pop it into the fridge. It will rise slower. Preheat the oven to 160C and then bake your challah till it sounds hollow when you tap it. 40 minutes or so is what it takes to get there. If your oven has space to do one at a time you can leave the waiting braid in the fridge. Don't forget to take it out 10 minutes before you put it to bake. Let the bread cool completely before you slice it. You can also pull chunks off the loaf using the folds of the braid to guide you.